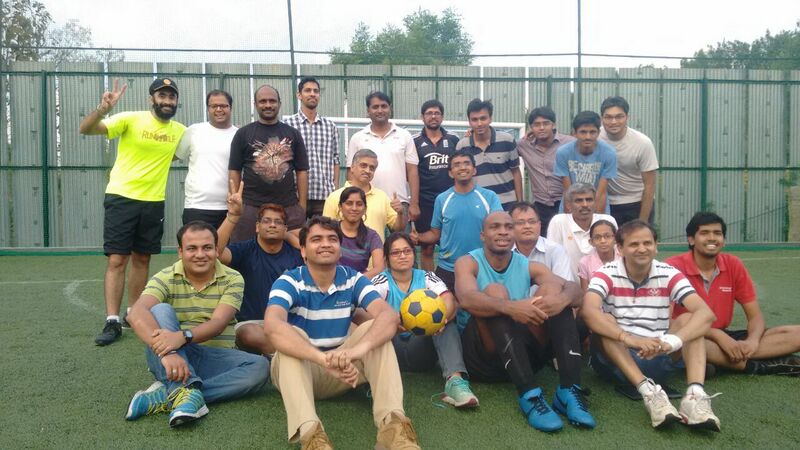 First time I played Football.. – Exploring Life..
One of my team members in office was leaving for his next role outside India and he invited us to a football game. My side of the floor was divided into three teams and the plan for the match was decided. I neglected the idea at first ( football and me , huh , nice try) but gave it a second thought and contemplated to myself ‘ I have nothing to do on a friday night and will be a good get together with a team’ . Brought shorts, T-shirt and Shoes to office and got geared up for the game that evening. Twenty of us left to the ground , ‘Power play’, in kundalahalli. We were having a trial game kicking the ball to each other. People around were forcefully striking the ball and I was intimidated. I was the only person in the gang staying away from the ball. The referee arrived and briefed us the rules of the game. I got to know some rules such as corner kick,throw in,free kick, fouls, goalie should not throw the ball over his head but under his knee, he cant catch the outside the goal post…phew so many of em..
We had three games, 15 mins each. I never expected that people in my team would play with utmost sportsmanship, notwithstanding their age. People who won the best player awards were those who played with enthusiasm and energy not the ones who actually played game according to the rules or scored many goals. You realise its not bad after all!